Today's basketball game will now be played at Paakuma' vs. the Golden Valley Knights! SITE CHANGE: Today's basketball game will now be played at Paakuma' vs. the Golden Valley Knights! 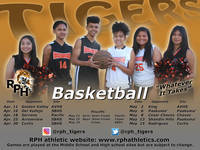 Come to the game and support our Tiger basketball program. The girls start at 3:30 p.m. and the boys start around 4:30 p.m. The cheerleaders will perform at halftime of the girls game! GO TIGERS!